Mt. Spickard: crown of the Chilliwacks near the Canadian border. Mt. Spickard: highest peak in Washington lower than 9,000 ft and 19th-highest overall. Mt. Spickard: 5th-highest summit in North Cascades National Park. Mt. Spickard: 9th-most-prominent peak in Washington (4779P) and the only one among the top 15 not on this site...until now. Mt. Spickard: 70th-most-prominent peak in the contiguous U.S. and therefore a worthy objective to those interested in bagging peaks in that list. So why wasn't it up on this site? The Two Bobs: this page is for you. Mt. Spickard is a large mountain but only one of several that vie for climbers' affections in the area. In fact, nearby playground bully Mt. Redoubt (8,969 ft) probably sees more climbs per season. To Spickard's north across the wonderously beautiful Silver Lake (6,763 ft) are two other Top 100 peaks: Mt. Custer and Mt. Rahm. To Rahm's east are a few more demonic crags. But the jewels sought for every Top 100 peakbagger are just to Spickard's southwest: The Mox Peaks (aka Twin Spires). These have been described as the hardest two peaks to attain in the Cascades. I don't know about that but I will give them props. I have climbed both Mox Peaks but will not be providing a page for them on this site. Some things deserve to maintain their mystique. >> 0.8 miles to the southeast across a deep notch is "Tombstone Peak" (Pk 7895) -- first climbed by Gary Mellom, Reed Tindall, Don Avriett, Phil Van Duyne, and John Roper on July 5, 1980. Mt. Spickard was previously known as Glacier Peak but was re-named for Warren Spickard after he tragically fell to his death on nearby Northwest Mox. In fact, if you visit NW Mox you can read Warren's entry in the register. The first ascent of then Glacier Peak occurred long before Spickard visited. In 1904 an ascent was made by Walter A. Raeburn either alone or with others. The second ascent occurred the next year 1905. The third ascent occured in 1906. Quite a lot of activity for so early in the 20th Century. Visitation to the area no doubt fell silent for many years. It is known that Fred & Helmy Beckey climbed Spickard from the southwest after completing their first ascent of NW Mox on June 21, 1941. The geology of the mountain and area is complex. Skagit volcanics from the Tertiary Age overlay Custer gneiss. Specifically, the south and east flanks are comprised of volcanic breccias while the west flank is gneiss. Some granite is also around. The rock doesn't set up well for technical climbing. It tends to be fractured and loose. Even so, a Class 4 rock route on the Northwest Ridge has been done. Mt. Spickard lies at the heart of the Chilliwack Mountains, which extend into Canada. Although a one-day (car-to-car) climb could be possible, it really is a two-day climb. Or if you have the means to stay another day you can visit other mountains nearby. There are three approaches worth mentioning here. Two will keep you in the U.S. but they are longer and more rugged. The third requires an entry from Canada. I have only the done the third one. See below for the descriptions for these. Note: I have not done this approach so can only speculate and paraphrase information found in Beckey's Cascade Alpine Guide. This approach leads to the north side of the mountain where more difficult climbing is necessary (glacier climbing then Class 3/4 rock). Hire or rent a boat for a trip up Ross Lake (or down Ross Lake if coming from Canada). A water taxi can be hired at Ross Lake Resort at the south end of the lake. Call (206) 386-4437 to reserve the taxi. See their information page for directions on how to get to the resort. The resort is located next to Ross Dam. The trail to the dam is 13.5 miles east of Newhalem and 29.5 miles west of Washington Pass on the North Cascades Highway (SR-20). Have the taxi drop you off at Silver Creek. The mouth of Silver Creek dumps into Ross Lake (1,600 ft) about two miles south of the Canadian border. Expect the trip from the resort to the creek to take at least two hours. It is about 25 miles. There is apparently a trail up Silver Creek on its north side. As the crow flies it is six miles from Ross Lake to Silver Lake north of Mt. Spickard. The trail ends in 2.5 miles (c. 2,900 ft) at a cabin. The route, now cross-country but there may be blazes, then crosses several slide slopes and forest slopes high above the creek. You want to take the northerly fork of the creek, which splits at 3,440 ft. From here on stay close to the stream (outflow of Silver Lake) but avoid cliffs as necessary. Above about 4,000 ft the terrain should be semi-open so you should be able to see where you're going (unless it's foggy). 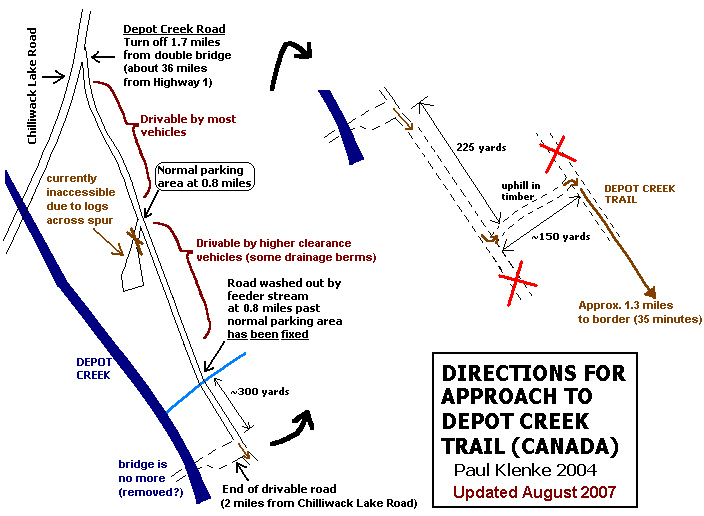 The whole time you're doing this approach you'll be asking yourself why you didn't go the Depot Creek way. Note: I have not done this approach so can only speculate and paraphrase information found in Beckey's Cascade Alpine Guide. The route leads to the south base of the mountain. From here the climbing is Class 3 to make the summit though steep snowfields should be expected. As for the Silver Creek approach, you'll need to hire a water taxi from the Ross Lake Resort or hire one from the far end of the lake in Canada. The resort is located next to Ross Dam. The trail to the dam is 13.5 miles east of Newhalem and 29.5 miles west of Washington Pass on the North Cascades Highway (SR-20). Have the taxi drop you off at Little Beaver Creek approximately 11 miles up-lake. There is a campground at lakeside (1,610 ft). Hike the trail westward for 4.5 miles to Perry Creek Shelter (2,080 ft). Leave the trail and enter the Perry Creek drainage to the north. There used to be a trail up the valley but it has long since disappeared. The valley turns westward. Travel through mostly open forest until the terrain becomes less and less vegetated. In about 5 miles from the shelter (c. 4,400 ft) begin climbing north up the valley slope toward the south slope of the peak. Take the path of least resistance up this endless talus and heather slope. Several rock barriers will present themselves but all can be passed with routefinding. At higher elevations starting at about 6,600 ft, permanent snowfields should be expected. If no snow, then annoying talus. The finaly 400 ft steepens somewhat but should not be hard. From camp in Perry Creek (~4,400 ft), allow 4-5 hours to make the summit. Gain = 4,500 ft. This is by far the easiest approach to the mountain once you leave your car. Getting to the trailhead is another matter. Note: If entering by car from the U.S., it is advisable you tell the customs agent at the border that you are on your way to climb in Canada. Make up some Canadian peak if you have to (Slesse Mountain is a good choice). Don't tell the agent you're using Canada to access peaks in Washington. This kind of unsanctioned/unpatrolled crossing is technically illegal. It is unlikely the agent will know where Mt. Spickard is, but you never can tell. It's your typical "Don't Tell When Asked" policy. First find yourself in Canada driving either east or west on the Trans-Canada Highway (Hwy 1). Get off of that four-lane behemoth at Sardis (Vedder Road). This exit is about 30 km east of Abbotsford or 45 km west of Hope. Drive south through town for three or four miles (last chance to gather supplies except for a mom and pop on right outside of town). The road will turn left at Chilliwack River Bridge (Vedder Crossing?). Mileages are measured from this turn. Follow the paved road for a long time. Pavement ends in 25 miles at the north end of Chilliwack Lake where there is a new provincial park on the right. Continue straight ahead. There may be a "Road Closed" sign in the road. Simply drive around this. I'm not sure its intent. It's been there both times I've been up there. The road continues along the east side of the lake. BE PREPARED FOR POTHOLE HELL! I think this road is in the Guinness Book of World Records for the Most Potholes per Mile of Road. Low-rider cars highly not recommended. At 32.6 miles at the southeast end of the lake Depot Creek Road forks off on the left. (There is another fork just before this fork that you don't want to take; so be sure you get the correct one; the correct one is 1.7 miles beyond the bridge with yellow rails.) The initial bit of road looks overgrown and is somewhat rocky. A normal car should be able to make it, however. In about 0.9 miles a short spur on the right leads to a parking area (c. 2,200 ft). If you have a 4WD vehicle, you may be able to continue another 0.8 miles to a new washout. (Before the October 2003 floods, you could drive past this washout for another 0.2 miles or so.) If you do continue to this washout, hope that there's not another vehicle parked up there as there is only enough room for one vehicle to turn around and park. You may have to back up a good distance to find a place to turn around. Advise you turn the car around when you get there. Don't wait until you get back. See this photo for a sketch of the final road and intial trail sections. From the washout, continue along the overgrown road for several hundred yards to a junction. The rightward road goes over an old bridge. Stay straight. In another 400 yards or so past the junction a road goes left into thicker forest. THIS IS THE CRITICAL JUNCTION. You must go left here. DON'T continue straight on the flat road. The road in the woods climbs for about 150 yards to a T-junction at a higher overgrown road paralleling the one you left moments before. Go right (southeast) and follow the road through mud bogs for about 2 miles to the international border. Canadian logging took place right up to the border. On the other side is nice old growth. It's like night and day. The trail comes to a boundary obelisk and shortly thereafter a North Cascades National Park register box. In 2004 the continuing trail up Depot Creek was full of new windfall. These will slow you down. You still have about 5.5 miles to go to get to the standard camp at Ouzel Lake. The first 4 miles is relatively flat and uninteresting. All that changes when you arrive at one of the most spectacular if not THE most spectactular waterfall in Washington: Depot Creek Falls. The trail crosses two brushy swathes (some awkward steps) then makes its way up and through a streamcourse before arriving in a roar at the base of the falls. Be quick or be prepared to get wet from the spray. The "trail" approaches a wet 8-ft rock step on its left then climbs up it on that side. There may be a handline here. It is easier to climb up than down. You may wish to have 20m of rope on hand to get down this on the return. A big boulder allows for an anchor. It can be downclimbed but it isn't easy because it is so slick. Once past that step you will then be in the full brunt of the spray for the next 100 feet as you scramble slabs and boulders directly below the slabby plummeting falls. The trail continues on the left side of the falls up a steep break into the brush above (look for a permanent handline). This part of the trail is the steepest of the day. With grunts and groans, make your way up the east side of the falls. The trail angles across a talus slope for a short stretch. It can be lost here so keep keen. Above this the trail becomes obvious again all the way to the top of the headwall (4,800 ft). Atop the headwall, the trail descends a few feet then crosses swampy ground leftward (east) to the east side of the flat area. Keep on the east side of the valley between talus and the stream for about 0.5 miles until the trees end. The next stretch used to be very brushy but the October 2003 floods changed all that. Now all you have is a rocky scoured streambed to deal with. There is one chancy area where the creek nears the bank on its east. Once past that, the continuance to Ouzel Lake is open but exhausting (there are lots of depressions and boulders to walk through and around). There are several sandy campsites available at the north end of the 5,700-ft lake. Time from car to lake = 5-6 hours; Distance = 8-9 miles depending on where you park; Gain = ~3,500 ft.
Mt. Spickard is located within North Cascades National Park. As such, standard park policy applies. Leave no trace; take no natural objects back with you. The Park Service would like you to obtain a permit for the area. Yet, a permit is not so easy to obtain unless you don't mind going out of your way to get one in the park offices in Sedro Wooley or Marblemount. If you'll be coming from the north via Canada, you may not be going anywhere near those offices. I'm not sure why they don't allow for self-issue permits at the border register on the Depot Creek Trail. It's not like you're going to see many people while in there. I believe a Trail Park Pass is required at the Ross Dam Trailhead on the North Cascades Highway. No parking permit is required for the Depot Creek Trailhead. The best time to climb Mt. Spickard is June through the first signifcant snowfall of Autumn. The earlier in the season the more snow you'll have to contend with (this could be good and bad depending on what it covers). The later in the season the icier the glaciers will be. However, crevasses are more obvious later in the season. For the Perry Creek Approach, I imagine good campsites will be easy to come by at around 4,400 ft in Perry Creek. The Perry Creek Shelter in Little Beaver Creek probably is a good place too. Where you camp will largely depend on how far you get on Day 1. For the Silver Creek Approach, if you can make it all the way to Silver Lake then the best camping is there. Otherwise, I can't say. For the Depot Creek Approach, the best camping is at Ouzel Lake. Mt. Spickard can be climbed from that lake in a day. However, if you would like to add Mt. Rahm and Mt. Custer to your itinerary and you are not speedy like we were, you may do well to transfer your camp to the 7,380-ft Depot Creek-Silver Lake saddle. It will take about 90 minutes to climb from lake to saddle with a heavy pack. Depot creek road is now (Jul 2007) drivable with 4WD to trailhead. Thanks for the update. But I am a little confused. I thought the "trailhead" where the small parking area is down the short road to the right was always drivable by an ordinary car. Maybe there was a washout I didn't know about that happened recently. Can you tell me where your trailhead (as you state it above) is on this map I made in 2004? Thanks. That at least saves 2 miles of road round trip. I made it to that old bridge in my old Honda Civic in 2003. I wonder if my Subaru Forester will make it. I just went up there last weekend. I see what you mean. I made it to the end with no problem with my Forester. An Outback could probably do it but will surely scrape its undercarriage a little more. As of August 2014, this map is no longer needed. There is only one drivable road, and it leads to the trail, with an open parking area near a gravely wash-out. The road is drivable beyond there with high clearance, but parking and turning around could be difficult. Thanks. Are you saying Chilliwack Lake Road, shown at the top of my map, is blocked/undrivable past the junction for the road up Depot Creek? If so, is the Chilliwack Lake Road gated, or overgrown, or washed out? When a driver reaches that point will it be obvious where they are? The Chilliwack Lake Road is, indeed, closed a bit after the Depot Creek Road. The Depot Creek Road I found is the second-to-last turnoff before the gate; the last one ends quickly. There was no need for the "uphill through timber," or avoiding the two X-ed out roads: I just followed the obvious main road as it deteriorated into a trail past the pseudo-parking-lot.